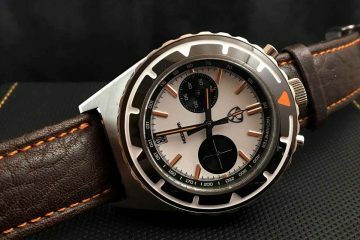 316L stainless steel case and bracelet, also available in leather/steel and leather/gold. 41.5mm across by 14mm (appx), 150g on bracelet. Bracelet is solid-link, solid end piece, Oyster style with fliplock, four micro-adjustments, split pins and signed clasp. 7-hand Swiss ISA 8173 analog quartz movement. Hand applied indices at 3 and 6, etched ‘Culinary’ on the left side of the case. Hour, minute, second, and GMT hand all lumed. Hours/minutes/seconds, with subseconds at 3 o’clock. 12-hour alarm (it’s the red hand, at 6:30 in the picture above). Second time zone function (the 24 hour hand is the lumed one at 11 o’clock above). The alarm subdial at 10 o’clock also doubles as a battery gauge. Date at 4 o’clock, and day of week via the six o’clock subdial. Water resistant to 50m (160ft). Unique cooking theme carried throughout. Please continue reading for the details on the culinary theme and the review proper. There are watches designed for activities (Rolex Sea-Dweller, Omega X-33), and there are watches designed to be reminiscent of activities (Jaeger-LeCoultre Reverso, any dive watch with diamonds on it). When I cook, I want readability and lots of loud alarms, which is why I think that this is more the second than the first. While it’ll do just fine as a watch worn for cooking, the analog alarm and lack of countdown timer are kind of limiting. However, as a watch worn to remind you of a favorite avocation, it excels like nothing I could have imagined. Really. Let’s go over some of the design cues, because they’re not at all obvious to the casual observer. Note the lug attachment to the case above – the case section is designed to look like the riveted handle of a pan (e.g Calphalon). ‘Culinary’ logo etched in the side of the case above. Circular graining stamped on the dial, as in a fine saucepan. The buttons and crown are shaped like the knobs of a gas range. The flared bezel and domed crystal look like a metal & glass lid. The ‘crowning touch’ (pun mine) is the unique arched and riveted crown guard, also intended to resemble a pan’s handle. Let’s detour and talk features for a bit. The ISA quartz movement isn’t one I’ve seen used before, and has some very nice features. The 12-hour alarm is semi-useful as most of us prefer a daily alert, but its analog hand is quick to set and read. The second time zone feature is potentially quite useful, and since its analog you can set it to any offset you want, which is nice for New Delhi, Auckland, and such. I did find one design oddity: the GMT hand looks to me like a normal second hand, so I kept expecting it to sweep. On the other hand, it’s easily read at a glance and lumed to boot, so if you need another timezone or travel frequently, that’s a win. The battery gauge feature is an enormous win, and I hope that other quartz movements copy it immediately. The watch wears quite comfortably. 42mm is a moderate size, and the low profile, angled lugs, and domed shape combine to slip easily under cuffs. The brushed finish on case and bracelet is attractive and unobtrusive, though as your eye nears the dial, the amount of reflective elements increases (bezel, hands, indices).The overall effect is quite attractive, and I must say that the Culinary garnered compliments from co-workers who don’t usually notice my coterie of watches. Although initially skeptical, I’ve become a fan of the design. The culinary design cues are subtle enough to not shout “I’m a chef!” yet are still a reminder of an avocation or profession. It’s very functional, eminently readable at a glance, and stylistically versatile enough for almost any setting. 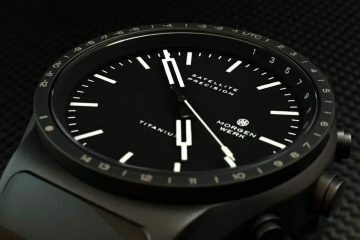 Thematic watches often suffer in functionality, but here they’ve managed to avoid that trap. For example, the buttons and crown are shaped like gas knobs, but that doesn’t make them uncomfortable, slippery, or hard to use. unique, practical and surprisingly attractive. List prices range are $350 for leather/stainless, $595 for 24k gold plate and $365 for the bracelet version reviewed. I consider this to be a very good value. 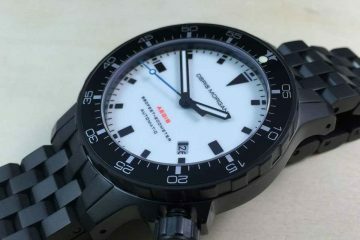 Our thanks to Morpheus Watches for the review unit.